The fall is here! It’s time to think over some autumn decorations and outdoor features for your backyard. Use the tasty fall gifts for décor – pretty pumpkins, squashes and other vegetables. Also a slight hint at Halloween or Thanksgiving decorations are welcome too! 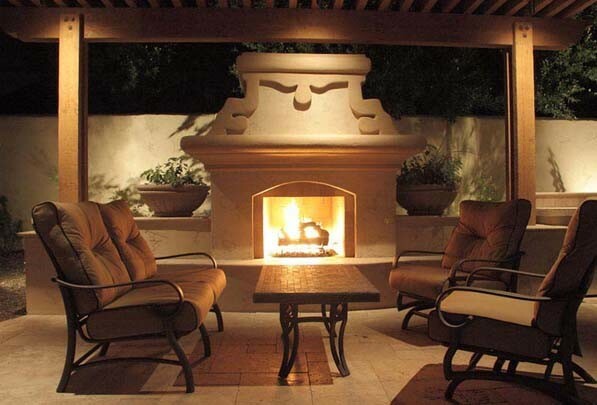 Below you’ll find some cool fall friendly features that are a must have in your Arizona backyard. Fall is the prime time to get cozy. Interestingly enough, even if the fire features that you incorporate you in your backyard don’t provide any additional warmth (i.e. fire bowls), just the presence of fire alone can trick the mind into believing that it is a warmer space. That said, if you really wan to add some heat to your backyard or patio area, then consider adding either a fire pit or an outdoor fireplace. When coupled with a number of overstuffed comfortable all-weather chairs and sofas, you’ll easily be able to take those winter parties outdoors. When the weather cools down it makes it a lot more fun to cook outdoors. There’s nothing better than eating wonderful foods prepared by you and your family, cooked using a little fire in a wood burning pizza oven. It’s visually very pleasing, can warm up the backyard and also very efficient and economical. Pizza ovens are not just for pizzas either. You can cook roasts, casserole dishes, bake cakes all without having to clean the grease inside the oven! It will burn off in the fire on the oven’s hearth – you won’t even know it! Fall is a season that is appreciated for a variety of reasons, but one of Fall’s biggest perks are the best opportunities it holds for outdoor activity. Are you looking for a way to improve your golf game, bond with your family or entertain at parties? Putting greens in your backyard are a good option for those looking for a nice addition to their home. As most golfers know, putting greens are finely cared for, cut short and smooth, which is not only difficult but time consuming with natural grass. And, putting in your own backyard on real grass isn’t the best practice with the dips, holes and weeds to block your way. Artificial putting greens provide a smooth, straight line to the hole that is impossible to achieve on real grass. Whether it’s a covered patio, a gazebo, Ramada or even a pergola, by adding any sort of roofing you’ll be providing your guests with a sense of security from the elements. Unique Companies has many different ways of creating a covered patio. As licensed general contractors, we are one of the only landscape and pool companies that can legally build one of the structures with one of our custom landscape pool projects. We have many different types of structures available but the most popular are the pergola or a Ramada/gazebo.